At times Ive been amused by titles like "Pit Bull Training", "How to train a Pitbull", "Bring out the genius in your Dalmatian", "Teach Your Chihuahua to Mind You". After all, its not as if there is some great mystery locked inside a particular breeds genetic code that makes training just fall into place once you know it. The thing is, a lot of people search for training information related to a specific breedhence the title--Pit Bull Training. And, it is widely known that certain breeds have traits that make them well-suited to perform specific jobs. Sometimes, that involves a specialized kind of training. But, most dog owners just want a well-mannered companion who doesnt tear up the house, jump on visitors or run into the street. The good news is that whether you intend to compete in utility trials or whether you just prefer that walking your dog doesnt involve a rotator cuff injury; there is one thing that really does bring everything about training into focus and make it fall into place. It is simply thisunderstanding, I mean really understanding how dogs learn. Its shocking how few trainers get this. They still cling to the J & P (jerk and praise) methods that were widely touted 25 years ago. If you think that is effective pit bull training, you couldnt be more wrong. For one thing, during the days when pit bulls were bred as fighting dogs, one of the traits they were bred for was high pain tolerance. That doesnt mean that pit bulls dont feel pain. They do. But, they tolerate it better than many other breeds. The particular danger with such methods for this breed is that it is entirely possible to seriously injure your pit bull before you realize it because they seem impervious to physical discomfort. So, if a trainer insists you use a choke, prong or shock collar--run, don't walk in the opposite direction. That is not the kind of pit bull training you should be looking for. The fact is that there is no need to use that kind of antiquated tactic on any dog now that we know so much more about how dogs learn best. Training when done right is a source of joy for both you and your dog. After all, its a game! It may be a serious game--like a serious game of chess. Dogs (unless theyve become lethargic from years of boredom or had it pummeled out of them) love to play games with their humans. How Do Dogs Learn Best? Its called by any number of names. You may have heard it called positive training, positive reinforcement, clicker training or shaping. By whatever name it goes, the cornerstone is its reliance on positive rewards (reinforcements) to modify or shape desired behavior and to extinguish unwanted behavior. Generally, its pretty easy to spot dogs that have been trained with positive techniques. They exhibit a certain joie de vivre that is lacking in dogs that have been trained with a heavy reliance on punishment (sometimes called correction). If youve used aversive training in the past, the newer methods may take some getting used to. But, positive pit bull training will absolutely transform your relationship with your dog. The bond that develops between you and your pit with positive training is something that has to be experienced to be appreciated. By the way, do you need to housetrain a puppy? Be sure to check out this excellent article on puppy crate training. 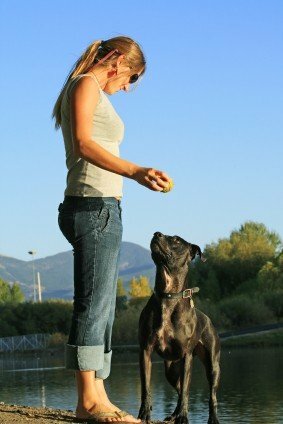 And if you're looking for help with a problem behavior, be sure to check out our section of articles on dog behavior training. While there are a few people who are naturals at training this way, for most of us there is a learning curve. So first, make a commitment to educate yourself about positive training methods. Over the years, Ive worked with my own dogs, hundreds of shelter dogs and had the privilege of attending workshops that were held by some of the best trainers in the world--experts like Karen Pryor and Ian Dunbar. And over time, I plan to share with you much of what Ive learned on this website and in my free e-zine: Bully For You! 2. The Culture Clash: A Revolutionary New Way to Understanding the Relationship Between Humans and Domestic Dogs by Jean Donaldson. While this is not so much a training book, it is an excellent key to understading dog psychology. If more dog owners read this book, the world would be a better place for dogs and humans. Canis Clicker Training offers a complete home study course that will take you from basic commands to cool tricks. It's available for download online. Additionally, if clicker training or positive obedience classes are offered in your area, by all means, check it out. Most people find that a hands-on class rapidly accelerates their learning of the techniques. Contact your local humane society or animal shelter to find out more about classes near you.